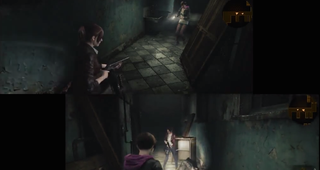 When Capcom revealed Resident Evil: Revelations 2 wouldn't have local co-op on the PC, the intrepid modding community immediately went to work. The result? Local co-op on the PC. In case you haven't been following this bizarre story from earlier this week, when Capcom put Revelations 2 on Steam, the product page promised the game would have local co-op for the game's campaign mode. The reason it could support co-op is because the game is structured around two characters running around with one another. It wasn't until just before launch that Capcom revealed local co-op would be exclusive to the console versions and was removed on PC. The company offered refunds to customers who felt burned by the mistake, but there still wasn't local co-op for PC owners and it didn't seem like Capcom was going to patch it in down the line. Leave it to the modding community to pick up the ball Capcom dropped. Well-known Resident Evil modder FluffyQuack debuted an early look of his co-op mod today. Remember, Revelations 2 came out on Tuesday. This is only four days later! Impressive work. Though it's not yet done, players can mess around with local co-op by downloading Fluffy Manager. The usual caveats come with downloading such software: it's probably buggy, etc.